Bruxism is just a medical term for grinding or clenching your teeth, usually while you’re asleep. That’s what makes teeth grinding hazardous to your oral and overall health, because there’s a good chance you don’t even know you’re doing it! Our dental office in Madison is here to help you learn more about bruxism and the damage it can do to your smile. We want to help you recognize the early warning signs of teeth grinding and help you protect your teeth from damage. The American Sleep Association suggests as many as 10 percent of adults and 15 percent of children are affected by bruxism. Teeth grinding or clenching is more common when there’s a family history of the disorder, with rates soaring to as high as 50 percent. Both males and females are similarly affected by bruxism. Are There Common Signs of Bruxism? Why Do I Have Bruxism? There are a few reasons our patients develop bruxism or teeth clenching. It’s most commonly caused by a combination of anxiety or stress. People who are agitated or stressed are more likely to grind the night away and not even be aware they’re doing it. In most cases of bruxism, a person isn’t even woken up by the sound of their teeth grinding together. 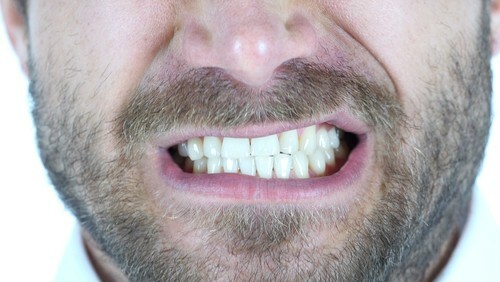 Having a misaligned bite, side effects from medications, and some medical diseases can also cause bruxism. Is there something not right about your smile? Are you concerned that you’re grinding your teeth? The best way to help yourself is to call our Madison dental practice to schedule a consultation. We can give you a comprehensive, thorough exam, learn more about the symptoms you’ve been experiencing, monitor your bite, and get a more in-depth look using state-of-the-art x-rays. From there, we’ll be able to see what kind of shape your teeth are in, address the severity of your teeth grinding, and put together a personalized treatment plan for you. We want you and your smile to stay healthy and be pain-free!